Healthy, edible sunflower oil is produced from oil type sunflower seeds. Sunflower oil is light in taste and appearance and supplies more Vitamin E than any other vegetable oil. It is a combination of monounsaturated and polyunsaturated fats with low saturated fat levels. The versatility of this healthy oil is used in cooks internationally. Sunflower oil is valued for its light taste, frying performance and health benefits. Its high proportion of valuable linoleic acid has steadily increased the importance of sunflower oil. The kernel makes up about 70 percent of the seed – with an content of oil about 55 percent. 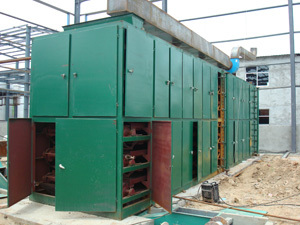 In order to obtain high-quality sunflower oil, the crude oil pressed by KMEC oil pressing plant must have the waxes as well as gums removed by using our sunflower oil refining process. In the finished product, these waxes would crystallize at low temperatures and make the oil turbid. In order to guarantee stability to cold (e. g. for storage in a refrigerator), the waxes are removed in the sunflower oil refining process. 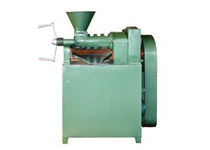 Cold-refining has the advantage that dewaxing can be combined with neutralization of the free fatty acids. Before cold refining starts, however, decanters and separators from KMEC sunflower oil refining process plant has already performed important steps in pre-treating of the crude sunflower oil. A decanter is used to remove coarse solids from the pressed oil. In turn, a separator is responsible for separating the hydrated gums from the water degumming process. Cold-refining is then started. 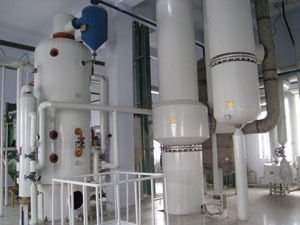 Following neutralization of the free fatty acids and crystallization of the waxes, another separator is charged with separating the soap stock and waxes from the crude oil. 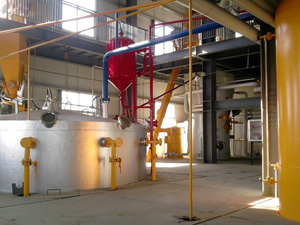 Once the heated crude oil has been washed, the wash water is separated by a further separator. 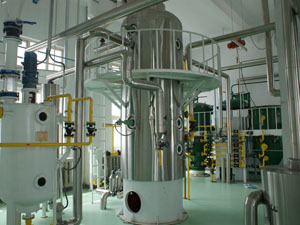 In the final process steps, the sunflower oil is then vacuum-dried, bleached and deodorized. 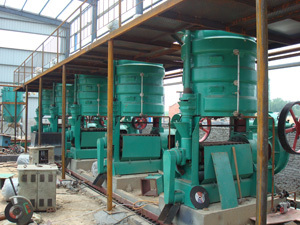 Contact us to get more information and double your sunflower oil mill output . Email us now.